What do you think, agree or disagree with his actions? Tonight, Denis Leary & Steve Harvey, two funny guys get serious ... about the Priest who wants to marry, Jon & Kate plus eight, and Britain's singing sensation Susan Boyle. Is Susan losing it? Plus, Denis Leary sounds off on why we should feel good about being fat, loud, lazy & stupid. Then, comedian turned relationship expert Steve Harvey has the scoop on what women need to know about men. Iain Clayton is the husband of Laura Ling, an American journalist currently being held in North Korea. Laura and her colleague Euna Lee were taken captive on March 17, and on June 4th will be tried for entering the country illegally and intending "hostile acts." Iain, along with Laura's sister and TV personality Lisa Ling, and other family members, will be on LKL Monday, 9pm ET. As the trial date of June 4th approaches, I grow increasingly apprehensive and nervous about the fate of my wife, Laura Ling, and her colleague, Euna Lee. They have now been detained by the Government of the DPRK [Democratic People's Republic of Korea] for nearly three months. During this time I have had very limited contact with her and really, really miss her. I think about her every moment of the day and try to imagine what she is doing, how nervous she must be and ask what I can do to make things better and ultimately bring them home. We have been together for 12 years and this is the longest I've gone without hearing her voice. We just bought our first house and it feels so empty without Laura. The pillows she ordered arrived a couple weeks ago, I wish she could see them. Apart from writing her a letter every day, I have tried to make her situation a little more bearable by sending her parcels of things she loves – like dried squid and beef jerky. Since USPS, FedEx, UPS and DHL do not deliver there from the US, I have resorted to sending them via my family in the United Kingdom. I found out today that one I sent nearly three weeks ago has finally arrived. I find it amazing that it takes that long to send a parcel anywhere in the world. I think it is this isolation that attracted them to the assignment in the first place. A trip that may end up with them indicted and tried, even though they were journalists simply covering a story. See the full interview Monday. Joining Larry will be Lisa Ling, parents Mary & Doug Ling, and Laura Ling's husband Iain. Also scheduled to appear Euna Lee's husband Michael, and their daughter Hannah. LOS ANGELES - An openly gay teen is the new prom queen at Fairfax High School. "I feel invincible," Garcia said wearing his rhinestone studded tiara. A few days earlier, he gave a speech that touched a nerve with students: "At one time, prom may have been a big popularity contest where the best-looking guy or girl were crowned king and queen. Things have changed and it's no longer just about who has the most friends or who wears the coolest clothes," Garcia told a gymnasium full of seniors. "I'm not your typical prom queen candidate. There's more to me than meets the eye." FOR MOST it might seem a bit morbid or bizarre, but for students taking courses on how to build your own coffin it is quite natural to be interested in designing your body’s final resting place. And for those who prefer to work at home (and thus avoid the trouble of transporting the finished item) the internet is full of coffin making instructions. Besides saving a bundle of money (or rather, your relatives’ money), the handcrafted coffin is made according to the size and personality of the owner, as a celebration of his life. It can even make a fantastic piece of home décor! It is not advisable that grandkids bump into grandpa’s or dad’s coffin in the garage, so place it openly in the guest room as an exotic bed, or buy a trendy flowerpot and turn the coffin into just another unorthodox coffee table – a sure-fire conversation piece. Of course, it is also a great Halloween prop. In an article in an upcoming issue of New York Times Magazine, former President Clinton discusses his wife's new role as the country's top diplomat. 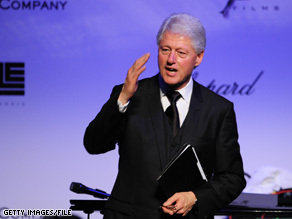 WASHINGTON (CNN) – Bill Clinton's campaign-year resentment of President Obama is a thing of the past, according to a lengthy profile of the former president in Sunday's New York Times Magazine — but he hasn't quite come to terms with the Kennedy family's decision to back Obama over Hillary Clinton during the primary season. Clinton reportedly has yet to make his peace with Sen. Ted Kennedy and the Massachusetts senator's niece, Caroline, over their high-profile endorsements of Barack Obama during the primaries. The Times, also citing unnamed sources, says Clinton harbors hard feelings toward New Mexico Gov. Bill Richardson, who held several posts in the Clinton administration but who chose to endorse Obama instead of Hillary Clinton. The former president has adjusted to his wife's new role on the international stage. "She used to look forward to me coming home from wherever I've been," Clinton says in the magazine article. "Now I'm afraid I'll be second fiddle to whatever world leader she's just met. Later, he added: "… We've reversed roles." Clinton also made clear that his vast network of global contacts and knowledge of world affairs is always available to Secretary of State Hillary Clinton. "'If she asks, I tell her what I think,'" the former president says in the profile. "And if there's something that's going on that I feel that I have particular knowledge of, I say that.'" 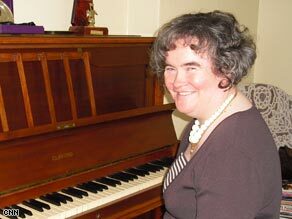 Stressed-out Susan Boyle threw Britain’s Got Talent into chaos yesterday by threatening to quit just 24 hours before the grand final. The Hairy Angel is cracking up over her amazing zero-to-hero star status. Churchgoer Susan, 48, cannot take the pressure of being in the media spotlight every day. And she has been left in tears by the recent backlash from critics – and celebs such as Lily Allen, 24 – slating her as over-rated and fake. Mitt Romney says he finds some of Sonia Sotomayor's past statements 'troubling,' but that he will give her a chance to explain her views. (CNN) – Former Massachusetts Gov. Mitt Romney said Thursday he's keeping an open mind when it comes to Supreme Court nominee Sonia Sotomayor, but added he finds some of her past statements "troubling." "There are some things she said that are troubling for those of us who believe that the job of a justice is to follow the law and the constitution, not to create law," said Romney during a forum with business leaders in Washington, DC. "But let's give her the chance to explain her views, to describe her record, and to be party to a full and complete and fair process. And let's do it in a very civil and respectful manner." Romney's comments are in line with the majority of Republicans on Capitol Hill, who have expressed reservations about President Obama's pick for the high court but have said they will withhold final judgment until her confirmation hearings before the Senate Judiciary Committee. 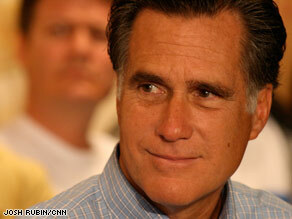 "I think our process in giving the justice – or the nominated justice – an opportunity to state her case, to describe her judicial philosophy, to take us through the decisions she's made in the past, and to have a complete and thorough review, should be a process which is carried out in depth," said Romney, who sought the GOP presidential nomination in 2008. "It should be a civil response to her position." Air Force Lt. Col. Victor Fehrenbach, a decorated military weapons systems officer who grew up in the Dayton area, is being recommended for discharge after 18 years of service for homosexual conduct, an Air Force spokesperson said. The move has made Fehrenbach, who was born at Wright-Patterson Air Force Base and graduated from Wayne High School in Huber Heights, a face on the controversial Don’t Ask, Don’t Tell policy for gay military personnel because of his high rank and distinguished career. “Victor is a great human face that shows the problem that is ‘Don’t ask, Don’t Tell.’ This is happening every day,” said Kevin Nix, spokesman for the Servicemembers Legal Defense Network, a national non-profit organization that is providing Fehrenbach with free legal counsel. How Many Sotomayor Opinions Were Overturned? Q: What percentage of Sonia Sotomayor's opinions have been overturned by the U.S. Supreme Court? Have Judge Sotomayor's decisions really been overturned 80 percent of the time as Rush Limbaugh stated on May 26? A: Three of her opinions have been overturned, which is 1.3 percent of all that she has written and 60 percent of those reviewed by the Supreme Court. Of the majority opinions that Judge Sonia Sotomayor has authored since becoming an appellate judge in 1998, three of them have been overturned by the Supreme Court.